This tutorial explains how to create a nice colorful stuffed-like text effect, using a simple pattern, and a couple of layer Layer Style. This tutorial can be adopted to look like fridge magnets. Metal Texture 2 by goldberry2000. Create a new 1024 x 768 px document. Set the Foreground color to #cecece and the Background color to #949494. Pick the Gradient Tool, choose the Foreground to Background gradient, and click the Radial Gradient icon in the Options Bar. Then create a radial gradient from the center of the document to one of the corners. Place the Metal Texture 2 on top of the Background, then change its layer’s Blend Mode to Color Burn, and its Opacity to 40%. Create the text in All Caps using the color #f4edd2. The font used is Tondu and the Size is 300 pt. Duplicate the text layer. We will use the first text layer to create the stroke, and the second one to create the main stuffed effect. Now, we are going to create a simple pattern. So create a new 5 x 5 px document with a White background. Then, pick the Rectangular Marquee Tool and click the Add to selection icon in the Options bar. Create 1 x 1 px squares diagonally through the document as shown below. Fill the selection with Black, and press Ctrl/Cmd + D to get rid of the selection. Go to Edit -> Define Pattern, and type in a name for the pattern. Both Glow effects are used to intensify the shadow effects by changing their Blend Modes to Multiply. This will give the text the stuffed look. Press the Ctrl/Cmd key and click a text layer’s thumbnail to create a selection. Next, we’ll be filling and applying different layer style values for each letter separately. So start with the first letter, create a new layer on top of all layers and rename it to whatever letter you’ll be working with, and change the new layer’s Blend Mode to Multiply. Pick the Rectangular Marquee Tool and click the Intersect with selection icon in the Options bar. Then, draw a selection around the letter you want to work with. The letter will be selected separately. 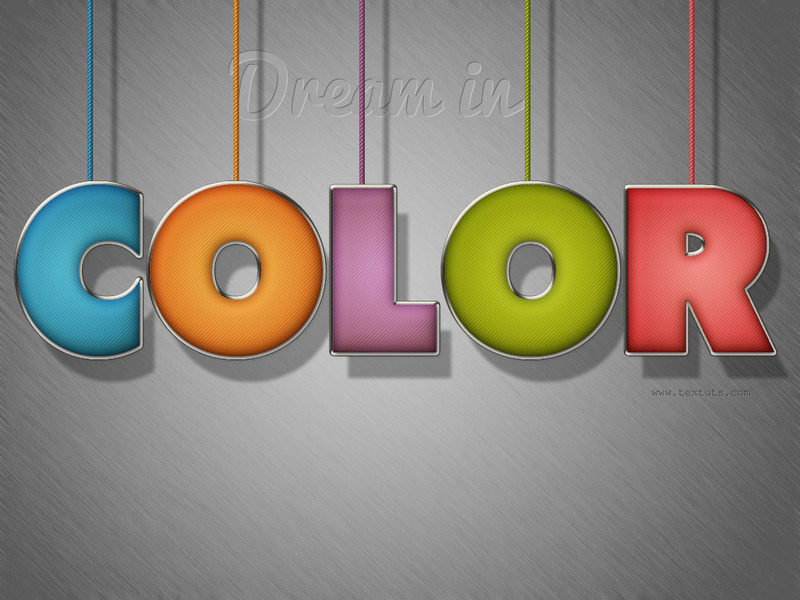 Fill the letter with any color you like. Here, the color used is #4ea6d0. For the gradient, you’ll need two colors. the color to the right is #070606 (this one will be used with all the other colors), and the color to the left is any color that goes with the letter’s fill color. You can try different colors and check the preview, then choose whatever color you like. The color used here is #9de0ff. This will make the letter’s fill look more vivid. Repeat the previous steps to each one of the remaining letters. Set the Foreground color to #d7d0c0 and pick the Line Tool. Set the Weight to 7 in the Options bar, and create a line behind the text layers as shown below. 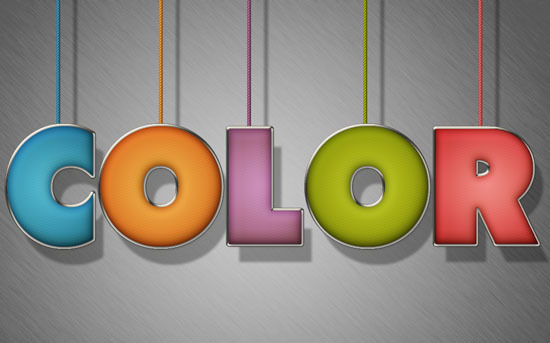 Choose a color that matches the letter’s color. Here, the color used is #347c9e. Duplicate the line shape layer, and move the copy to the right in order to place it behind the next letter. Double click the copy layer to change the Color Overlay to a new color that matches the new letter’s color. Here, the color is set to #e57e2e. You can change the shape’s fill if you don’t want to apply a color overlay, but using the color overlay includes the fill in the layer style, which makes copying it to other elements easier. Do the same for the rest of the letters. It’s so nice, and your instructions are so clear to follow! excellent design and creative effects in this tutorial. Helloe Rose it will be great if u publish ur source file. It will be better for begginer. You can buy the source file here if you like. All the PSD source files are available for paid download as well. You can check the store page for now, and later on each tutorial will include the source file paid-download link. Erm… store page not working? We are working on the store for the near future. But right now, there is no store. You can still leave any queries you have though, and we’ll be glad to help. How do you load the diagonal thingy coz i can’t make it load to the textures please reply! You do not need to load it, once you define it as a pattern it will automatically show in the patterns palette. Just click the arrow next to Pattern in the layer styles dialog box and scroll down, you’ll find the pattern there. very good ,go on sir. I keep getting stuck on Step 4. How do I create a new 25 x 25 document? I did all the steps correctly except for number 4. What am I doing wrong? You need to go to File -> New, and enter 25 for both the Width and the Height values (in pixels). And once you’re done with the pattern, just close this one and go back to the original document to continue working. great great great tutorial,Thanks a lot Admin !!! “So create a new 25 x 25 px document with a White background. Then, pick the Rectangular Marquee Tool and click the Add to selection icon in the Options bar. Changed the values in the tutorial. Your work can be seen even in Ukrain. Thank you. You tuts are so easy to follow. Thank you. Glad you find them so. That’s great! Glad you were able to follow the tutorial. Happy you found it so. I love it 🙂 Very good job its nice and easy to apply. Great to know you found it easy to follow. Adoro cores e mais ainda eficiência. Disponibilizar os recursos para o tutorial e explicar de forma clara o passo a passo sem dúvida facilita e incentiva. Sucesso Garantido! Parabéns! That’s really so nice of you to say, I’m really glad you enjoyed it and found it easy to follow. Why not? What happens when you try to do it? Please explain what happens when you try to work on that step, what goes wrong? Very nice tutorial, and quite easy to follow. Just wondering how you do the ‘Dream in’ Text behind the strings. You can check the third effect in the Three Simple Elegant Headers Text Effects tutorial, and it will help you understand how to create a similar result. Please feel free to add a reply if you have any other queries. Thank you for your interesting tutorial. Each tutorial just blows my mind! This is the best website/tutorials I have come across. THANK YOU SO MUCH!!!! That definitely means a lot! Thank you very much for the amazing comment and for the support. ???? ??? ???? ???? ?? ?? ???? ??? ????? thank you for this nice work. but I have a problem with creating a pattern!!! could you put the link of pattern? I have got it. according to your advice above I was try draw the above pattern and I got it, later on I will send my final result. Glad the problem was solved though. quote (Sorry about the late reply! Looking forward to seeing your outcome)quote. welcome to my outcome and your unlimited effort!! Hmm, I don’t seem to be able to access it. Is there a direct link to the final result please? I can see them now. Great job indeed! You sure can, and it’s always interesting to see what can be done with the effects.